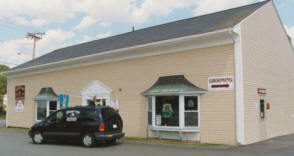 The Doggie Den opened its doors in September, 1998 in a small colonial cottage situated in downtown Northboro, MA. Between our growing Daycare and Grooming businesses, we found our cottage quickly bursting at the seams, and in November, 2000 we moved into a state-of-the-art 2400 sq. ft. facility a couple of hundred yards from the house. Our facility was designed specifically for doggie daycare by The Doggie Den owner, Susan LaDue, and was built by Northboro Commons, during the summer of 2000. Love of dogs, customer friendly, convenient. We're in the dog business because we love it. Susan was successful in more than one career before starting The Doggie Den, but dogs have always been her first love. It's the work that we love. Part of everyone's job at The Doggie Den is playing with the dogs. Whether it be playing ball or under a pile of dogs, we love to hang out with them. Our facility is right in the middle of downtown, Northboro, MA about 15 miles east of Worcester, MA We're a couple of hundred yards off the main street, Route 20 (click here for Directions). This isn't the most cost effective location for a dog business, but we want to make it easy for you! Commuters using major routes like I-495 and I-290 can be at our place with a ten minute detour, round trip. You can run other errands when you drop your dog off. We know about overcommitted lives, and we work hard to make your contact with us easy and pleasurable.